If you’d like to start writing live reviews of New England acts of your choice, contact tmax@thenoise-boston.com – please put LIVE REVIEW in the subject. In a stroke of inspired musical matchmaking, the me & thee’s tireless impresario Kathy Sands-Boehmer booked two acts at the me & thee this evening that complement one another insanely, Wishbone Zoe and The Suitcase Junket, both with Massachusetts roots. And both subscribe to what Wishbone Zoe’s Saera K. aptly characterizes on her website as “junkyard rock, crashitybash, and the distracted storytelling of important things.” It is a Waitsian everything-but-the-kitchen-sink DIY aesthetic that when done right takes the audience on a wholly original and gleefully demented carnival ride where the only musical rule is to have no rules. Wishbone Zoe is the brainchild of Northampton’s Saera K., a visual artist and multi-instrumentalist force of nature, who builds her own instruments from treasures gleaned out of thrift shops and dumpsters. Tonight the stage is bedecked with racks of percussive metal objects – strings of used bottle caps, old keys and dented tin cans – hanging curtain-like from a frame, waiting to be kicked or struck by a broken drum stick or a rusty spoon. Wishbone Zoe’s set of six tunes is a layered, interloping sound collage, ferociously original and quite unlike anything I have ever heard before. At times, she plays a Fender guitar or a five-string banjo and builds the foundation of a song with a simple track on her loop station, adding track after gonzo track until she has demented and brilliant symphony. Her songs end abruptly and without warning. Her voice can be a tender, plaintive whisper as on “Lullaby for Olga” or a jagged buzzsaw. Halfway into her set, Saera is joined by fiddler Caroline O’Leary whose masterful playing adds a soulful dimension to tunes like “OH” and “Lullaby” from Wishbone Zoe’s forthcoming album Fossils Dream. Wishbone Zoe’s arrestingly original, honest and otherworldly performance is the perfect bridge to Amherst’s Matt Lorenz aka The Suitcase Junket. Lorenz, who can only be described as a cross between a Woody Guthreyesque dandy and Salvador Dali with his long, curling perfectly waxed whiskers. 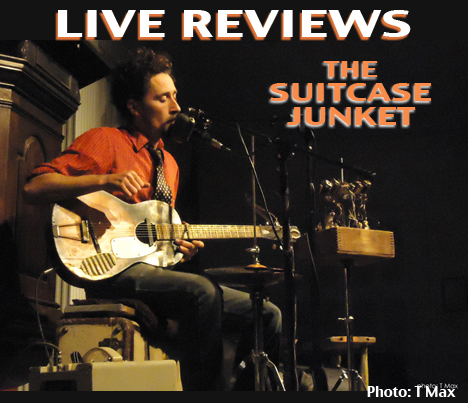 Sitting on a battered old suitcase, looking like a forlorn carnival barker from another planet, and rhapsodizing in a high, lonesome voice into the sound hole of his equally battered guitar, sending out waves of wiry feedback we know we are in for a long, strange and delightful trip. Like Wishbone Zoe, Lorenz’s stage is bedecked with quirky self-styled percussive instruments like pots and pans and a series of pedals that could sound a high hat, a ringing bell, or a thumpy, bassy kickdrum. “I’d like to take an opportunity to introduce the rest of the band,” he says with mock-solemnity. “On the left toe is a baby shoe hitting a gas can and on my right heel is a circular saw blade that makes a nice ringing sound.” This collection of self-styled percussive fantasies would bring a tear to Tom Waits’ eye. Following the eery murder ballad that opened the set, Lorenz beguiles us with a throat-sung intro to his next song, “Earth Apple” from his 2015 release Make Time. For the rest of the set, Lorenz continues to throw in flourishes of throat singing, explaining that he learned the technique in a failed South Indian cooking class and giving us an impromptu lesson on how to throat sing at one point but urging us to practice this new skill only in the shower and not within earshot of others. A sunny tune about a steeple on the roof of a garage in West Virginia featuring hints of throat singing and bright dings from Lorenz’s circular saw is played on a moldy guitar that Lorenz tells us he rescued from a dumpster at his alma mater. “Vinegar is really good at getting mold off,” he says cheerfully. This tune is followed by “Dauphine and Desire,” a sweet, swooning ballad about falling in love in the Crescent City. Lorenz’s set is interactive and full of goofy banter – “this song features my dog Scribner’s musical debut which I will bark in his absence” – and invitations to sing the chorus. Most of the songs Lorenz plays are from last year’s disc Make Time and Dying Star, his most recent seven-song EP. I picked the wrong night to leave my earplugs on my dresser. Heavy ’70s-style psychedelic garage rock is not something to listen to without protection. My first visit to the new Once Lounge & Ballroom in Somerville leaves me satisfied with the state of indie rock in the Boston area. It has the air of a DIY endeavor. The room looks like a converted Portuguese-American club function hall, complete with mirrored walls, thick, patterned wallpaper and a glass chandeliers. The staff has the look of veterans of the underground music scene. The sound system looks patched together from hand-me-down equipment but has clearly been put into the right hands. The sound is impeccable. It’s the perfect venue for a bill of psychedelic stoner rock bands. The room has the feel that is evoked every time I read about a show at the “insert-your-go-to-name-here” Ballroom from the early ’70s. There is no vestige of Boston’s commercial rock spaces in this new spot. Sand Reckoner opens the bill which includes Boston’s own Ghost Box Orchestra and D.C.’s Dead Meadow who are supporting their March release, Haunter. Sand Reckoner’s short and tight set runs the gamut of their evolving sound. From the dark, desert blues of “The Priest,” to the Black Keys-ish garage rock of, “Designer,” and on to “Gunsmoke,” which sounds like a half-speed Canned Heat on mushrooms. Throughout the set, every song commands attention. Guitarist and vocalist, Jonathan Lesh plays his hollow-bodied electric high on his chest, layering ample slide guitar into the mix; the signature of their rolling bluesy sound. When they get heavy, drummer Ben Hughes smashes a tribal beat, spending lots of time on the toms with felt-tipped sticks, creating deep, dark rhythms. When they pare back on the heavy he moves seamlessly to a lighter, jazzier style. Their new bass player bounces around the stage like a heavy metal head banger while rounding out the rhythms nicely. If the musical spectacle is not enough, the light show, comprised of a dueling projector backdrop of psych video rounds out the experience and immerses the room in a multi-sense deeply heavy experience. Arriving late to Right Turn, I catch the end of a sultry set of love tunes by Glenn Williams. He is co-founder of Lowbudget Productions, a complete music and multi-media production facility in Roslindale. He’s also the founder of BNN-TV’s It’s All About Arts – supporting all kinds of artists around the Greater Boston area. His crooning accompanied by his guitar and ukulele obviously thrills the audience. On the eve of the release of their splendid new album, Say So, Bent Knee have hit the road for an extended summer tour to drum up further interest in their sensational career. Because we’re unavailable to see their Boston record release show at Once Ballroom the following week, we travel to Lowell instead. The Hi-Hat is a tiny foyer of a room with a beautiful stage and stained-glass windows as a backdrop. We miss a third opening act, Shiloh, but instead are treated to a lovely, indie synth-pop duo from Portland, Maine called Forget, Forget, comprised of guitarist Tyler DeVos and keyboardist Patia Maule. Their intertwined vocals are mesmerizing and blissful, with exquisite layering of instrumental effects to flesh out their sound. I guess they were formally a quartet, but have pared it down to the essentials. I’ve seen this stylistic presentation before, but they bring a fresh turn with energy and charming songs (“Your Kid Sister” or “All the Kids”). Definitely a talent to keep track of. Now, the main act, Bent Knee! Everything I watched develop over the past 18 months has finally reached fruition. With a totally supportive indie label, proper representation, a booking agent ready to help them reach new audiences, and a sound so honed and determined, this art-rock-prog sextet is set to conquer. If their set tonight is any indication, they have merged the highlights of their past two albums into a can’t-miss showcase. Opening with Say So’s “Black Tar Water” segueing into “Leak Water,” they explode off the stage and the audience has immediately succumbed and stands numb. Following with two tunes from Shiny Eyed Babies – “In God We Trust” and “Being Human” – the ensemble is clicking on all cylinders. In Bent Knee music, there are no extended solos or grandstanding that once formulated the progressive rock sound, just an intricate pivoting of interlocking parts that enhance each piece. I have heard precedents of this approach from the long-distant past, but to hear it contextualized in contemporary music is absolutely thrilling. With great songwriting and a sense of being, these youngsters are adept in passing the musical torch along with skill and assurance – brilliant.